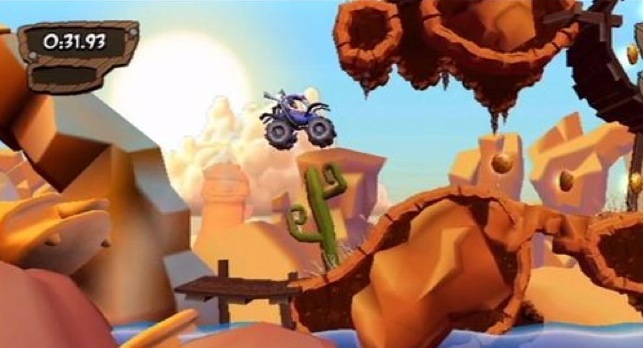 RedLynx has announced that its WiiWare title, MotoHeroz, will be available September 12 for 1500 Wii Points. This cute little racer packs a single-player campaign, leaderboards, as well as a four-player "party mode." It looks fast and fun, based on what I've seen of the game, and I'm getting a Uniracers vibe. The 1500 Wii Points price tag may be justified, too, with more than 100 tracks and planned daily online competitions. Allow me for a second to bust out the admittedly obnoxious "gonna dust off my Wii cliché." Because that's what I plan to do next week when MotoHeroz drops. Seems like a good way to prime it for the impending Skyward Sword release.